On Saturday, August 5th, 2017 my spouse and I attended the Holistic Columbus Expo in Columbus GA. My main purpose for going was to video tape my Mother who was invited to be on the panel discussion about “Conscious Aging”. The MC of the panel was Jason McKenzie. The panel consisted of Celia Solomon, Jerry Farber, Mike Howard, Donna Sweat and Hellen Pinkney (my mom). It was a great discussion to video and watch. The group shared experiences from their life journey. In addition, they opened up about how they had let go of some of their expectations and ideas related to life and how it should be. I was delighted to have the opportunity to participate in the moment. Below is the video that was created from that discussion. Let me know what you think or share your thoughts about Conscious Aging. Below is the link to my live Periscope broadcast that I did from my home business office. If you want to skip the blunders go fast forward about 2 to 5 minutes of the broadcast. I talked about setting up an online business (www.inpcreative.com) and how to look for suppliers outside of the U.S. So where did this holiday come from? I don’t know just thought I would label my post after it. I like to run. Not all the time. And truthfully I don’t have what is considered a runners body. I went to a Chiropractor one time because of a pinch in my back and he told me that I should do walking or elliptical training. I vaguely remember him telling that my hip bone was too wide. What ever did he me, I don’t know. This post will probable have no purpose in it. My goal is to begin writing something every day on this blog. Today I will be doing work for Amazon. I have joined the ranks of App Independent Contractors. (AIC) I left a steady job to run my business full-time. Part of my daily operations is marketing and promotions. Now is a great time to give a shameless plug. 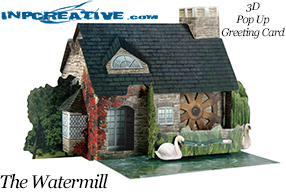 My website www.inpcreative.com is the best place on the internet to get 3D popup greeting cards. There I did it. That wasn’t so bad. Running a business is a lot of hard work. The lure of it is being able to write my own check. Tell myself what todo. Answer to only me. Yet the reality is much different. Going back to a 9 to 5 at this stage of the game is not an option. I have been running after this dream for over 20 years. Well my ADD is setting in. Time to run. As the saying goes, change is good. It’s time for a change on this blog/podcast/ etc. I have a dream… said Martin Luther King. Well so do I. My dream is to have a digital media company. But what does that mean really. Today so many businesses are labeling themselves as Online Media Companies or Digital Media Companies or Digital Marketing Companies. My point is labels don’t really define who or what we are or do. So what brought me to this change again. Well looking at my current stats and numbers from my iTune account and blog post views. It is clear to me I am attracting only crickets. So in order to be what it is I envision, I must change my direction and figure out a different strategy. Video is what I love to do. Audio is in a close 2nd place. Talent is there though could use some development. Equipment is available and ready to use. So what is the problem? I can only be NON-Relevance syndrome. You probably have the same symptoms as I do. No one clicking. No one sharing. And it looks like no one is even bothering to view your Social Media feed. Well if they don’t come to me I need to go to them. But I don’t want gimmicks and show boating. I want to deliver quality and be genuine. I won’t pretend that my motive is all about smiley emojis and thumbs up. Nope, I am also growing a business and a brand. I have babbled enough, my point to this post was to let you know that TheBSide Podcast was making a change for the better. Time to help other creatives like me find an audience and spread a message. We all have some fears we deal with everyday. As a small business owner I face many fears. In this episode I talk about some of those things and more.